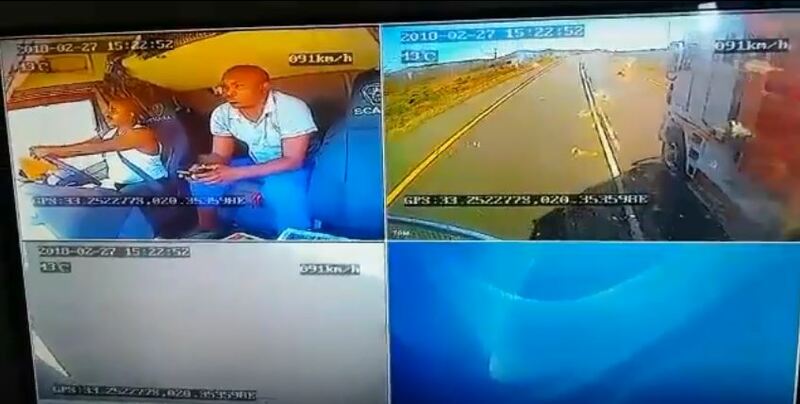 The Arrive Alive website received a video captured by dashboard camera of truck drivers failing to drive defensively. Even though the most obvious focus might be on a truck being overtaken illegally and unsafely across a barrier line, it also reveals some glaring unsafe driving techniques from inside this truck! “This is such a good case for a defensive driving opportunity because it is such a poor display of driving!! The driver – initially displays good driving technique but it soon degenerates to very poor. He uses his cell phone which leads to driving with one hand and even leaning against his side window. This may even indicate that fatigue is part of his current state of mind. The passenger is not buckled and is sitting in the middle chair while the passenger chair is available. This not only provides more opportunity for distraction but also remains the responsibility of the driver to remain compliant. Driving – The driver is overtaken and actually reduces his speed which amounts to awesome application of defensive driving, BUT this is soon diluted with his next chain of decisions. He decides after a while that he needs to overtake and breaks the speed limit while also indicating to his passenger how bad the other driver is. His overtaking options are poor, and his execution of the maneuvers are poor as he remains in in the on-coming traffic lane way too long. His decision to overtake the same vehicle that had overtaken him also creates a race type environment on the roads and also reduces safe overtaking options for LMV’s on the road. This is a clear case for defensive driver training on any level. One slip and this causes R5mil damage and possible loss of life. The operator should treat this driver as the highest possible risk in their business!